Players begin by choosing from one of three different classes, each a predesigned character beginning their journey in this fantasy realm and embroil themselves in a world of intrigue, politics and darkness and become centre stage in their own epic saga. In the game players can battle their way through a variety of different combat areas including tough puzzle based dungeons, which can be broken down into easy, normal and elite modes to add an extra challenge and chance at greater rewards for the player. Such areas as The Catacombs act as a multiplayer dungeon and allow players to enter the dungeon with their friends and Guild mates to clear it out and gain massive amounts of EXP and allows them to level up. This particular dungeon is on locked when players reach level 36 and players are able to attempt it 3 times per day and they can play it on either easy mode, which they can try to do solo or on normal mode which is considerably more difficult and requires a team. Players are able to gain Guardians and companion characters that will join them in battle, companions can be placed into the group formation which will determine things such as which characters are absorbed melee attacks on the front line. However, Guardians are considerably more powerful and give a direct boost to all of the character’s and mercenaries within the party greatly enhancing the groups Battle Rating as well as occasionally releasing powerful Guardian skills which deal and overpowering amount of damage to enemies. 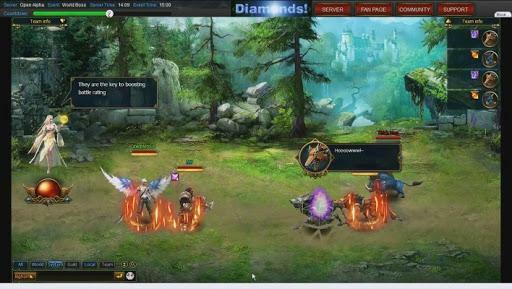 Both companions and guardians can be levelled up using different resources, companions cannot be more than 5 levels higher than the players main character whereas guardians have a maximum of 10 levels and once a Guardian reaches its 10th level access to a new Guardian is on locked (with 6 guardians in total to collect). For players that like PVP there are a few different options, most notably are the 8V8 Rumble, 3V3 Arena and the standard Arena. The standard Arena allows players to fight against each other to earn Honour, changing up their strategy, switching around their formations and upgrading them mercenary companions and gear, the results of a battle against 2 players will affect each of their ranking in the Arena and the higher a players ranking the more honour points they are rewarded each day. The 8v8 Rumble allows players to fight as a group with up to 16 players in total fighting against each other the players are split up into tiered groups based off their levels and players can only fight in the arena for their tear, players may enter the arena as many times as they like in a day but only gain bonuses for the first fight. Finally the 3V3 Arena allows players to put together a smaller combat group and fight at certain times during the day where they form a team and are automatically match with teams from all other servers, not only the server that their character exists on, which will earn them both great rewards and bragging rights. Those that like to try something a little different than simple combat players can engage in the Battle of Wits quiz event where players enter a huge library and that asked questions, which appear on the screen for 30 seconds and the players must answer whether they are true or false. If players answered correctly then they will gain rewards, but if they make a total of 3 mistakes they are turned into an alpaca.